I have not photographed A-Rod too much for my employer, The Boston Herald, but there are two memorable instances, seen here below. August 23, 2009- A Newbury St. walk with actress Kate Hudson. 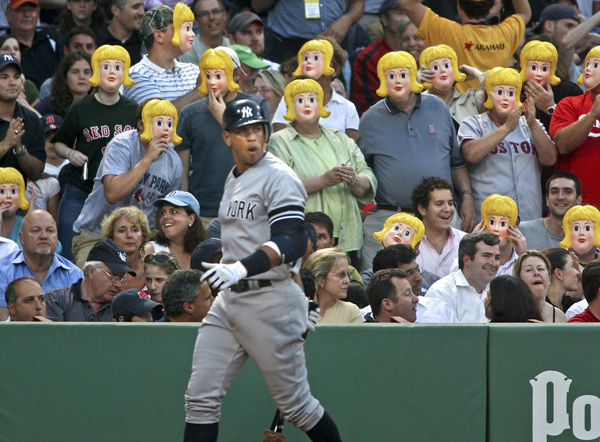 Boston Red Sox supporters tease New York Yankee Alex Rodriguez a day after he was reportedly involved in a scandal allegedly cheating on his wife with a blond exotic dancer/model. This entry was posted on Monday, August 19th, 2013 at 11:45 am	and is filed under Uncategorized. You can follow any responses to this entry through the RSS 2.0 feed. Both comments and pings are currently closed.